I am running a writing retreat next week and have been putting together lists of my favourite writing tools to share. I thought I’d share them here too. “The Sense of Style” by Steven Pinker, subtitled “The Thinking Person’s Guide to Writing in the 21st Century” is a book about why writing matters, what makes writing good, and how to navigate unsettling changes in language with style, without being stuffy about correctness. “The Book on Writing” by Paula LaRocque is a great guide to writing simply and for clarity. “Keys for Writers” by Ann Raimes and Susan Miller-Cochran is a (costly) reference text for academic writers. It covers the writing process, using resources and referencing, technical aspects of language and a very helpful guide to how the grammar of different languages impact on expression in English. The international edition is available through Exclusive Books (not Amazon). Refseek is a great source of reference web sites. Think of it like the reference section in a library. It has a guide to online dictionaries, including general dictionaries and those for specialist terms like medical, computer and financial terms. The site also gives links to other reference works, such as style and grammar guides. Visuwords is a really fun graphical dictionary where you enter a word and related words pop up around it. Try it! Good for really understanding all the nuances of any particular word and identifying possible ambiguities. Urban dictionary is a great way to while away a boring meeting or seminar. Words are defined by the users of the site so there is nothing official about them, but it gives great insight into how words are actually used. You can submit your own definitions too, so get creative! There is nothing like good writers for advice on writing. Here is one of my favourites, Ursula K Le Guin, on Rules of Writing. Explore her site for more or hunt for your favourite author online and let them excite you about the possibilities of words. 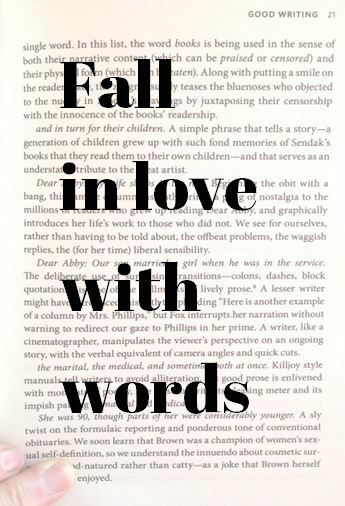 What resources inspire you to play with words? Share your favourites here.